It's seventy-five years after the events of the first volume, Roche Limit, and the next arc already has me on the edge of my seat. It doesn't take Michael Moreci long to establish the plot and the players. 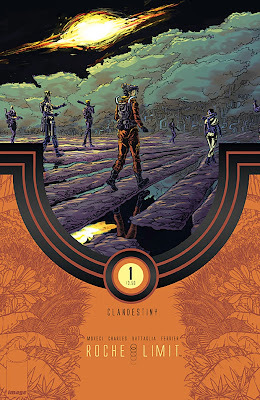 Roche Limit Clandestiny #1 is off and running. Welcome to your next science fiction obsession. All you need to know about this rag-tag group of soldiers and scientists is that they're on a mysterious mission to the barren planet. If you've ever seen a sci-fi film in the last sixty years then you know that there's nothing but trouble brewing on said "barren" planet. Luckily, the dialogue is crisp, profane and sometimes funny. There's also a moment of longing and sadness that is brief but powerful. The character development is quick and nimble as we get a sketch of who's who. No sooner as we get to know the players they're on the ground exploring and things aren't quite what they seem. Kyle Charles has his work cut out for him with all the different characters, landscapes and action scenes he has to choreograph in the very first issue. He handles it all with precision and imagination. Each character is distinctive, the views are sweeping and the pacing is pitch perfect. Matt Battaglia's colors infuse the story in purples, blues and orange laying out a vibrant canvas. If you loved movies like Aliens, Predator, or Leviathan then Roche Limit Clandestiny is the book for you. It's just getting started so you have to add it to your pull list and get ready to be taken on a ride.